The Snowy Mountain Lodge is located in Centennial, Wyoming. 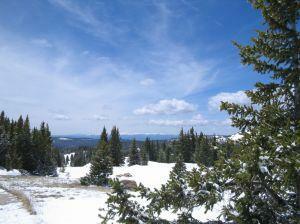 It is one mile east of the Snowy Range ski area, which is a classic, old school Wyoming resort. Centennial, Wyoming is less than tree hours from Denver, Colorado. As such, it offers a welcome retreat for Denver locals who want to escape the weekend crowds that head to Colorado's more famous ski areas. Likewise, residents of Wyoming who want to steer clear of the crowds, celebrities and former vice presidents that frequent Jackson Hole find refuge at the Snowy Mountain Lodge and the Snow Range ski area. The Gold Miner Cabin: The Gold Miner Cabin has a full-service kitchen and bathroom, sitting and dining room, private bedroom and a loft that features additional beds and a futon. The cabin sleeps eight people. Pets are welcome for a $10 fee. In 2010, prices were $235 a night plus 10 percent room tax. The Pioneer Cabin: The Pioneer Cabin features a small kitchenette and full bath. It has a sitting and dining area. The sleeping space provides a full size bed, as well as bunk beds and a futon. This cabin sleeps six people. This cabin is also pet friendly. In 2010, rates were $195 plus a 10 percent room tax. The Trapper Cabin: The Trapper is a back-to-basics cabin which sleeps four people. It has a partial bath and two bunk beds. Shower facilities are located in the main lodge. In 2010, rates were $75 a night plus 10 percent room tax. The Honeymoon Cabin: As its name implies, the Honeymoon Cabin sleeps two people. It has a partial bath, but showers are available at the main lodge. At $75 a night, this is obviously a choice for rugged newlyweds on a budget. Pets are welcome. All cabins allow a maximum of two pets. The Snowy Mountain Lodge restaurant, which was built in 1927, is open from 8am to 8pm, and serves breakfast, lunch and dinner. The lodge is surrounded by an abundance of snowshoe and cross-country ski trails. Snowmobiling is also available through Snowy Range Tours, which offers snowmobiling excursions for all levels of proficiency. The Snowy Range ski area is a mom and pop operation with an unfortunately cloudy future. According to an article in the Billings Gazette, the Snow Range ski lodge had a fire in 2003. The lodge was rebuilt, but the ski area owners were under insured. The area averaged 29,000 skier visits in 2009. Before the fire, it averaged 45,000 skier visits each year. Nonetheless, the resort did open in 2010, with a limited schedule. Snow Range is open from Thursday through Monday in 2010. In March, it will be open seven days a week. The mountain is situated at a base elevation of 9,000 feet, and rises to a summit of 10,000 feet. It gets an average of 250 inches of snow each year, and has 75 percent snow making capabilities. Five lifts serve 27 trails, which are divided into 30 percent beginner terrain, 40 percent intermediate and 30 percent advanced. The Snowy Range ski area and lodge may not offer the upscale amenities of the modern resorts. They do, however, offer a satisfying experience for those who long to explore the trails less traveled.